When do we get to walk in the shoes of saints? Or walk alongside with gods (and goddesses) for that matter. It is during pilgrimages, where sites and stories from holy books come to life. But beyond its spiritual importance, pilgrimages are also opportunities for inter-religious understanding. Famous pilgrimages from Judaism, Christianity, Hinduism, Buddhism, and Islam. Select the various pilgrimages from the drop down menu, and hover over the coloured routes to learn more about them. When we think about pilgrimage, we think of solitude. A lone and tireless pilgrim, an arduous journey, a test of one’s piousness. Pathways winding in different directions, like meandering rivers. At the end of the pilgrimage, the victorious pilgrim gets rewarded with spiritual growth, and some religious merit to boot. The etymology of pilgrimage derives from the Latin word “per (through) ager (field), conveying the sense of travelling across a distance. Pilgrim is derived from the Latin word “peregrīnus”, which allows for a wide interpretation, meaning anything from “foreigner”, “wanderer”, “exile”, “traveler”, “newcomer” to “stranger”. What makes a pilgrimage then, is not the pilgrim’s religious identity per se, for he or she could be an exile or a newcomer, but the physical act of travelling itself, the wandering. Which is why we can think of pilgrimage in another light. It is an opportunity for inter-religious understanding. By sharing the oral histories and textual narratives of how particular sites came to be sacred for the community, pilgrims from different religions can contribute to a collective wisdom constituted by their connected histories. At first glimpse, Christianity, Islam and Judaism seem to intersect only in antagonistic collisions. But it is precisely the commonalities in their religious texts that provided fertile ground for prolonged conflicts. The origins of the three Abrahamic religions can be traced back to Prophet Abraham, their common forefather. Islam acknowledges the Torah and the New Testament as sources of divine revelations; in fact Mary, the mother of Jesus, was cited more times in the Quran than in the New Testament. Jews and Christians, along with Sabians, are also specifically protected in the Quran as “people of the book”, as they have been given revelations from God. All three religions also acknowledge Adam, Moses, and Jesus as biblical prophets whom God has revealed his will to, which explains why inter-religious pilgrimage sites are often tombs or graves of prophets. 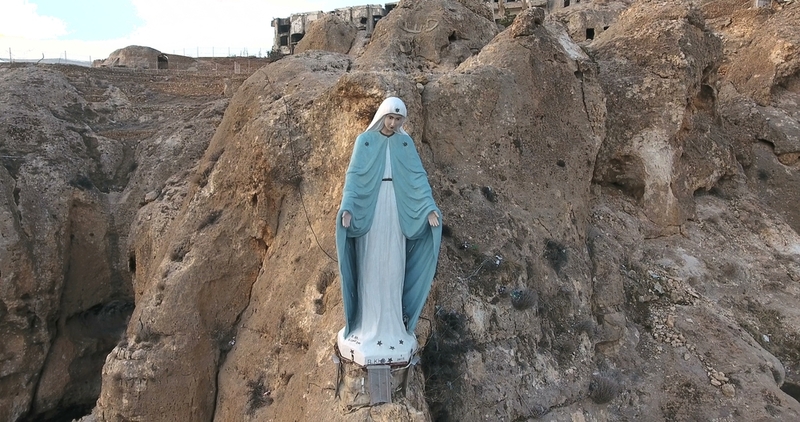 Our Lady Mary, Seidatna Maryam in Arabic, in Syria. The Old City of Jerusalem, otherwise known as Yerushalayim in Hebrew, or al-Quds in Arabic, is a living archive of the three religions’ histories. Christians, Armenians (who are also Christians), Muslims, and Jews, all reside in this holy city in different quarters, surrounded by highly venerated religious sites: the Church of the Holy Sepulchre, Dome of the Rock, al-Aqsa Mosque, Western Wall, and Temple Mount. Not too long ago, a similar place existed. After the Islamic State of Iraq and Syria (ISIS) seized it on June 2014, only remnants remain. Before ISIS, the Old City of Mosul was a bustling city inhabited by a religiously and ethnically diverse population, with notable churches, mosques, monasteries, tombs, and shrines under its care. Its cosmopolitan character harks back to the Ottoman period, where Mosul, then named Mosul Sanjak, served as the gathering place for Arabs, Kurds, Turkmen, Assyrians, Armenians, Sunni and Shia Muslims, Christians, Jews, Yazidis, and Shabaks, who lived in relative peaceful coexistence. All that changed during the “Fall of Mosul”, as ISIS bombed, razed, looted, and bulldozed Mosul’s architecture and murdered its people over a period of six days. Satellite imagery taken in 18 July 2017 where the architectural damage has exceeded previous reported estimates. Approximately 6,981 affected buildings - sacred and secular - in the Old City of Mosul have been identified. Data taken from UNITAR-UNOSAT; https://unitar.org/unosat/node/44/2631. These actions by ISIS are not representative of Muslims and Islamic teachings, even though it conforms to western media stereotypes of Muslims as terrorists and jihadists. Salafist-jihadists, in which Al-Qaeda and Islamic State of Iraq and Syria (ISIS) identify with, are a small and extreme offshoot of the ultra conservative Salafi movement, and Sunni Islam. In fact Muslims were the biggest victims. Ordinary Muslims could only watch helplessly as every aspect of their reality—from the sacred site of the Great Mosque of al-Nuri, to the profane, like schools and businesses—was decimated by a military regime that claimed to be doing it in the name of faith. Prophet Jonah’s Tomb, destroyed by ISIS in July 24 2014, was a pilgrimage site for Muslims, Christians, Jews, and his story can be found in both the Bible and the Quran. Left photo by Omar Mohammed, via Wikicommons. This iconoclasm—the destruction of religious idols and places—is justified by the Salafi-jihadi interpretation, which considers any historical artefact that is culturally or religiously alien to be a gateway to polytheism. This interpretation runs opposite to the beliefs of Sunni, Shia, and Sufi Muslims whom have venerated shrines for centuries. A closer look at the different types of ruined monuments in Mosul, from graveyards, churches, monasteries, madrasas, mausolea, to mosques. Inter-religious pilgrimage sites such as Prophet Seth Shrine (Nabi Shiyt in Arabic), and Prophet Daniel's Tomb, revered by Christians, Muslims, and Jews, were all part of the collateral damage. Data taken from Monuments of Mosul in Danger Project; http://www.monumentsofmosul.com/list2. Much like the burning of books across different periods of human history—from the Qin Dynasty (213 BCE), to the Nazi regime (1930s), and the Cultural Revolution (1966-1973)—the wanton destruction of Mosul’s monuments was a concerted effort to erase and impose a collective forgetting of how interconnected the sites and histories of Islam, Christianity, and Judaism are. Places are repositories of collective memories; by tearing them down, it becomes easier to inscribe a new version of history on a clean slate. To react to the actions of extremists with intolerance would then prove their point that it is every nation or religion for itself. This impulse is antithetical to Sufism, the mystical branch of Islam: a core tenet of Sufism is bridging differences by acknowledging our shared humanity. As a result, Sufis often embark on inter-religious pilgrimages in the world. Its followers go for Christian pilgrimages like the Camino de Santiago trail in Spain, organise peace parades in Cannes and Assisi with Christian, Buddhist and Jewish peoples, and participate in spiritual events such as the Festival of Sacred Music (Le festival de musique sacrée) in Fez, Morocco. At the same time, because of this inherent openness to interfaith understanding, non-Muslims from Milan and Paris also visit Sufi living saints in order to receive miraculous cures for illnesses. Hover around the pins to learn more about the inter-religious sites from all over the world. Sufism embodies a kind of fluidness that captures the sense of wandering in the etymology of pilgrimage. Perhaps the transformative character of pilgrimages do not come solely from completing the route, or seeing the sites. Perhaps it comes from wandering for wandering sake, so that by opening ourselves up to visiting places that are sacred to people from other religions, we return with a renewed understanding of our faith. Acim, Rachid. 2018. The reception of sufism in the west: The mystical experiences of american and european converts. Journal of Muslim Minority Affairs 38 (1): 57-72. Coleman, Simon, John Eade, and European Association of Social Anthropologists. 2004. Reframing pilgrimage: Cultures in motion. London; New York;: Routledge. Esposito, John L. 2002. What everyone needs to know about Islam. Oxford: Oxford University Press. Flaskerud, Ingvild, Natvig, J. Richard. 2017. Muslim Pilgrimage in Europe. Routledge. Nováček, Karel, Melčák, Miroslav, and Beránek, Ondřej. 2016. Monuments of Mosul in Danger. Accessed Nov 1, 2018. Pazos, Antón M. 2013. Pilgrims and pilgrimages as peacemakers in christianity, judaism and islam. Burlington, VT;Farmham Surrey, England;: Ashgate Publishing Company. Smith, Valene L. 1992. Introduction: The quest in guest. Annals of Tourism Research 19 (1): 1-17. United Nations Institute for Training and Research’s Operational Satellite Applications Programme (UNITAR-UNOSAT). 2017. “Damage assessment of Old City, Mosul, Ninawa Governorate, Iraq”. Last modified July 25, 2017. Isabella loves to dig beyond what is ‘commonsensical’ or ‘natural’ to us, by looking at the larger forces (or even accidents), that may have structured these beliefs. A writer at Kontinentalist, she is particularly interested in social issues - religion, crime, identity, and food. 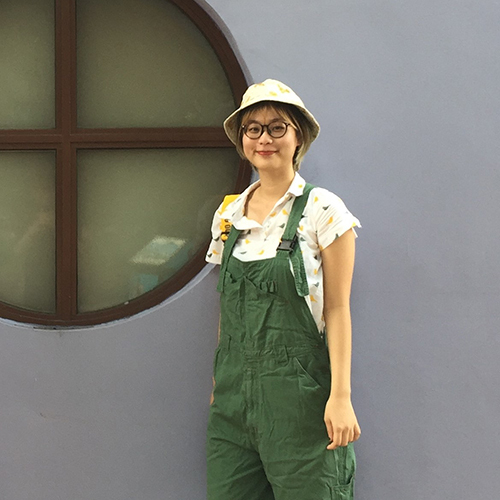 While she strives to stay curious about the world by listening to podcasts and taking classes, she is at her happiest when she’s eating pastries, cakes, and drinking tea.